Stewart Waltner, 51, of Bloomington was given an ultimatum: Do something about his weight or take a risk of not being able to see his youngest child graduate college or get married. After weighing in at 383 pounds with a possible life expectancy of 55 years, his primary care physician at OSF HealthCare Medical Group – St. Joseph Drive, Dr. Richard Ginnetti, recommended the Health Management Resources (HMR) Weight Loss Program through OSF HealthCare. He knew he couldn’t do this alone, so he insisted his wife, Edythe, join him on this journey. “I always tell people that Stewart took me kicking and screaming,” Edythe laughed. The HMR program partnered with OSF HealthCare St. Joseph Medical Center to provide a non-surgical, weight-loss program based on healthy lifestyle changes. The program focuses on a “more is better” philosophy. The participants eat six small meals a day to keep their metabolism and glucose in balance. The couple began HMR in August 2014, and they both explained that their lives have drastically changed since starting the program. Stewart set the clinical record for losing the most weight of 56 pounds in 13 weeks. Edythe, age 53, has reached her long-term goal of 140 pounds. 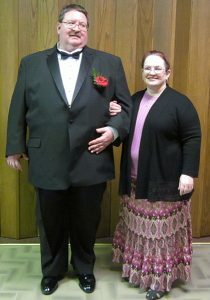 Stewart and Edythe said the program’s physicians and nurses have been supportive throughout their weight loss journey. “The physicians and nurses focus on how far you have come,” the couple said. “They never make you feel like you have failed after a bad week, and always remind you of the benefits of your hard work. 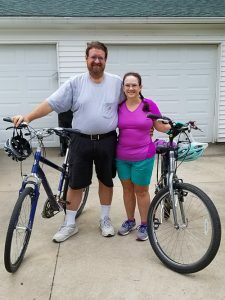 “And one of the best things about our weight loss is that I can wrap my arms totally around my husband in a hug!” added Edythe. As the leading provider of diet programs to the medical community, HMR has helped more than 1 million people make lifestyle changes to lose weight and be healthy. HMR classes are 20 weeks long and involve education and problem solving through group discussion. HMR also includes exercise consultations and nutrition consultations conducted by a licensed dietitian. HMR has been named a Best Diet for FAST Weight Loss, and a Best Diet for Weight Loss by U.S. News & World Report 2017.